What's in Central Vapors EJuices? Our ingredients contain USP Grade Propylene Glycol and USP Grade Glycerin along with a blend of USP Grade Natural and Artificial flavorings. We use only the highest quality USP Grade Nicotine suspended in VG with a certified Certificate of Lab Analysis. Liquid nicotine is tested and recorded to be at no less than 99% pure before any eliquids undergo mixing in Central Vapors facility. Welcome to the world of vaping. So what is that little gizmo everyone seems to be carrying around these days? If you happen to be wondering this yourself, here's some information to familiarize yourself with the basics of an electronic cigarette. Ok, so you're new to the e-cigarette and have no idea where to start, in the following few paragraphs we’ll begin with the basics. We will routinely compare the e-cig with the traditional cigarettes you're used to in an attempt to help you better understand. BUT the e-cig is VERY different in many ways, the most important being that the e-juice used in e-cigs is 100% tobacco free! So, what is an e-cig? An e-cig, also called an e-cigarette, electronic cigarette, or a personal vaporizer is a small battery powered device that vaporizes the e-juice liquid, usually by either simply inhaling or by pressing a button. It contains a battery and an internal heating element for vaporizing the e-juice liquid. What's the difference between smoking and vaping? Smoking is essentially the inhaling of the smoke created when you burn the ingredients of a cigarette whereas vaping is the process of inhaling the vapors created by an electronic cigarette as it heats the e-liquid until it transforms to vapor. The key difference between smoking and vaping is the burning part, also known as combustion. When you smoke a cigarette, the result is the burning of thousands of different ingredients, many of which we have never heard of and a list so extensive it would consume an entire page. Unlike smoking, using an e-cig—most commonly known as vaping—with the vape liquid is safer because far fewer ingredients are used to manufacture e-liquid. Vaping is made possible by the battery contained in every e-cig. This battery is used to heat a small coil until the vape liquid reaches boiling point and turns into vapor. The e-liquid, or e-juice, used in the ecig does not create smoke, only vapor which has no by-products like ash or cigarette butts. E-cigs are also usually highly appreciated by anyone nearby because there is no cigarette smell. Electronic Cigarettes, E-Cigs, Vape Mods? These are all common names for the same device. An electronic cigarette, e-cig, or vapor cigarette are all common names for a battery-powered device which closely simulates that of smoking a tobacco cigarette. In its most basic form, the electronic cigarette vaporizes the specially formulated vape liquid solution, creating the familiar smoking sensation. The electronic cigarette was primarily designed to be an alternative nicotine delivery device in which many flavors can be incorporated into the liquid to create a pleasant taste but do away with harmful tobacco inhalation. Many vapor cigarettes are constructed to resemble similar smoking products like cigars, cigarettes, and pipes featuring the cylinder shape appearance. So first things first, you will want to choose your e-cig and you're probably wondering which one is best for you. One of the most popular, reliable, and cost effective e-cigs on the market would be the eGo style e-cigs. This particular brand of e-cigs is easy to use and widely available; chances are, if you know someone who currently uses an e-cig and ask them about the eGo brand, they will know exactly what you're talking about. The e-juice is best described as the liquid you would use to refill your e-cig. E-juice, also referred to as e-liquid, comes in many different bottle sizes, flavors, and nicotine strengths. E-liquid, e-juice, and vape juice are all common terms referring to the liquids vaporized in an e-cig. Composed of only 3 to 4 ingredients, E-Liquid contains Vegetable Glycerin, Propylene Glycol (often abbreviated PG/VG), flavor, and usually nicotine—which is optional for customers. Vegetable Glycerin along with Propylene Glycol makes up the majority of the e-juice liquid. Both of these ingredients are food grade products used in various types of foods, including some toothpastes and candy flavors, and are commonly available in the market for baking or making candy. The optional nicotine used is pure pharmaceutical grade quality liquid nicotine and makes up no more than about 2.5% of the total contents in the e-liquid. So, to put it all together, if your favorite flavor is blueberry and you usually smoke a medium amount of cigarettes, you might want to consider placing an order similar to the what you see below. Now that you understand the basics, the next step is to choose the right e-juice for you. Here at Central Vapors, we make the best e-juice vapor liquids or your money back! All of our e-liquid products are manufactured in Dallas, TX and made from quality ingredients by passionate professionals! We carry a selection of over 150+ e-juice flavors available online and a vide variety of e-cig brands and styles. So what’s you favorite eJuice flavor? Feel free to explore the Central Vapors site to your heart's content and find exactly what you want. For those that cannot decide, we also offer an e-juice sampler pack so you don't have to choose! Our electronic cigarettes and vape devices are top quality from reputed manufacturers and guaranteed to last or we replace it FREE! 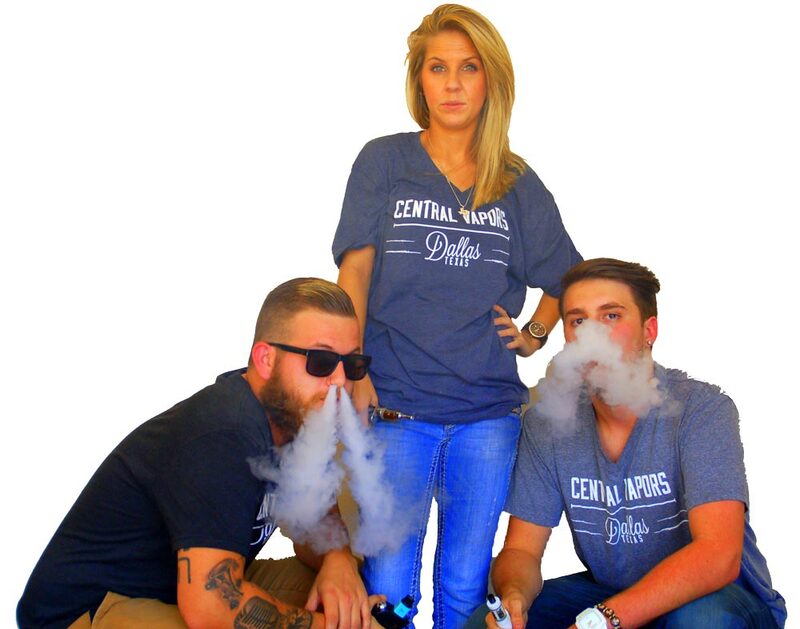 At Central Vapors, we are extremely passionate about e-juice, e-cigs, and customer service. If you have any questions about vaping, e-juice, or e-cigs, we are always happy to take your questions. Any and all online orders are always backed by our Money Back Satisfaction Guarantee; if you're not completely satisfied with your e-cigarette liquid or e-cig device, we want to hear about it. Want a replacement? Send it back and we will promptly replace your e-liquid flavor or e-cig device with another of your choice*. We invite you to try us out if you haven't already and hope you enjoy your visit with us. We enjoy hearing from customers and fellow vapers so please feel free to contact us anytime and for any reason. Want to protect your right to vape, find out how you can support vaping. *Replacement policy refers to 10ml-50ml ejuices sizes and excludes all bulk sizes. What is the ratio of PG to VG in your juices and what kind of PG, VG and nicotine do you use? Our standard ratio is 50% PG to 50% VG; however variations of this ratio are available. We use this ratio because it provides the ideal consistency and produces the ideal amount of vapor. We use only 100% natural kosher Vegetable Glycerin together with USP Propylene Glycol which is 99% pure and made in the USA. The liquid nicotine we use comes from flue-cured leaves which have been grown and handpicked. All the flavors we use in our e-juice also come from U.S. suppliers. We don't water down our products and NEVER use any other additives. Do you offer nicotine free e-Juice? Absolutely, there are many e-juice users who prefer the nicotine free e-juice, and if you order our e-juice this way, it comes free of nicotine. What nicotine strengths do you offer? Are you planning on adding more strengths? We offer the following strengths: 0 mg, 3 mg, 6 mg, 12 mg, 18 mg, and 24 mg nicotine. Or, try blending your own e-juice flavors with our DIY vape juice mixing supplies! Why has my e-juice changed color? Over time, e-juice changes color from a process called steeping. Steeping occurs as the ingredients blend together more evenly throughout the e-juice. Technically the e-juice doesn't change colors, the original color simply becomes darker. If you store your vape juice in a dark place, the color change occurs at a slower rate. In many cases, the full effect of your e-juice only comes out after the steeping process begins! So, you ask, how long is the steeping process? Well, many people have different opinions but in our own experience the flavors in the vape juices become more savory and delicious in as little as a few days! Is there a shelf-life for the e-juice? Our e-juices are good for at least 12 to 24 months if stored properly. You can even refrigerate your e-juice to make it last even longer! We actually have our very first bottle of e-juice and it still tastes as good as or better than day we made it! How do I know what strength of e-juice to buy? For the beginners to e-juice, it's best to start in the middle if you're not sure, because you can always move up or down accordingly. If your choose an e-juice with a nicotine concentration higher than what you're used to, you may experience headaches and/or dizziness. If you experience headaches, dizziness, or any discomfort whatsoever, please discontinue use immediately! If you choose a nicotine concentration that is less than what you're used to, you may find that you aren't satisfied, and continually are wanting more. The above suggestions are merely just that; your doctor's advice or directions should be followed above any suggestions or advice offered from Central Vapors. The FDA has tested some electronic cigarette cartridges and released highly controversial results. Electronic cigarettes and e-juice are NOT "FDA approved." However, excluding the liquid nicotine, all the ingredients in our e-juices have all been approved and deemed "safe for human consumption" by the FDA. The bottom line is that e-juice vapor does not contain many of the chemicals found in the smoke produced from smoking a cigarette. No long term studies have been conducted in the United States on the use of e-juice, but at this time, no instances of death or extreme sickness have been have been clinically linked to the use of electronic cigarettes. How much e-juice will I use? This answer will be different for everyone, in general, the average person who smokes one pack a day will use about one 10ml bottle per week. If you're logged in, see "Order Status" in your account. Once your order is shipped, you will receive an email with a tracking number. You can track your package at any time using that number on The United States Postal Service’s Website, www.usps.com If you ever feel like your package was lost or not delivered correctly, please contact us and we’ll be more than happy to look into it! If you have not received your order for your vape products, check the tracking information to view the status. If you have already done this and feel you should have already received your order please contact us. We ship most orders via the United States Postal Service using either First Class or Priority Mail with delivery confirmation. You will be provided a tracking number at the time of your vape order's shipment. However, please note that the USPS does not guarantee updated tracking until delivery. The estimated delivery time is 3-6 Business days for First Class and for Priority Mail it is 1 to 3 days within the domestic United States. We have found them to be the most cost effective option. NOTE: This service is not guaranteed, but in most cases they deliver packages within this time frame. One of the things that makes us better than other sites that offer e-cigarettes and e-liquids is that if you place your order before 12 pm (Central Time), Monday through Friday (excluding holidays), and everything is in stock and age verification has been completed, your order will ship out that day. In many cases you will receive your order within 3 days. (Most likely in the State of Texas.) If you place your order after 12pm on weekdays or anytime on a weekend, your order will ship out the next business day. Yes! Although we are based in the United States, we have expanded our reach to a few certain select countries. At this time, we currently ship to the United States, Canada, United Kingdom, and Australia. During the checkout process you will see a box that says "Discount Code." Simply enter in the code and the page should automatically update the total within 3 seconds. If it does not, please call us or email us and we'll help you with the checkout process. Coupons and discount codes will be sent to customers who have created an account and are subscribed to our mailing list. If your order was placed in the State of Texas, you will be charged 8.25% sales tax for your order since Central Vapors is located in Texas. Any orders shipped to destinations other than Texas will not be charged sales tax. Yes, of course! The more the merrier! If you require bulk pricing, please contact the Central Vapors team through email or call us at (469) 828-7307 and we will be more than happy to provide more details about our wholesale vape opportunities! I'm a retailer of e-Juice, do you offer wholesale opportunities for resellers? During the checkout process, you will be prompted to either checkout as a guest or to create an account. We suggest creating an account for a more streamlined checkout experience on your next visit, as well as to maintain your order history. You don't want to be our friend? Just kidding, you're more than welcome to checkout as guest if you like. Again, we suggest creating an account due to all the shipping updates and features you have access to once an account is created. You do not have to be on our mailing list, even if you do create an account. So if you are worried about too many emails, just “opt out” at any time and we’ll be more than happy to take you off the list. However, we hope that you opt to stay on our list as every mailing has special discounts that are only available to our newsletter recipients.